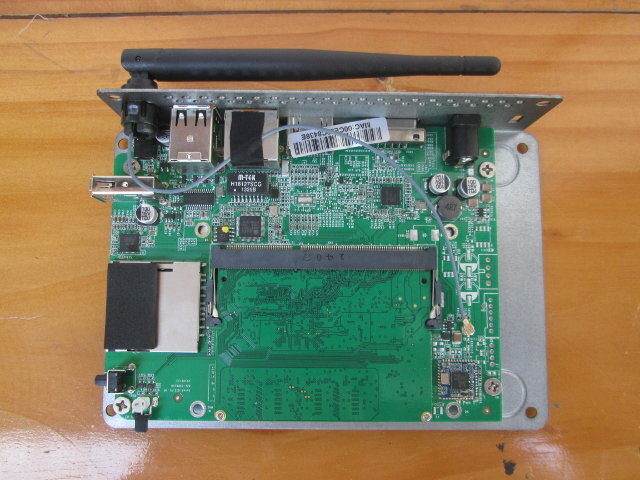 MeLE PCG03 was announced in October 2014 with an aggressive price tag of $49 for large orders for barebone systems, and was said to support Windows 8.1 or Android 4.4. 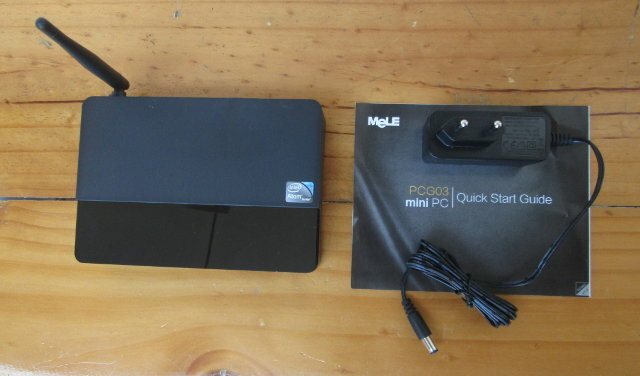 MeLE is PCG03 now is now available with 2GB RAM, and 32GB eMMC, and with a properly licensed “Windows 8.1 with Bing NTE”, but no Android for $149 on Ebay, or Aliexpress, and it should eventually show up on MeLE Amazon store. The company sent me a sample for review, so I’ll start by listing the updated specifications, and taking pictures today, before running benchmarks, trying out Kodi, and trying Ubuntu in other posts. The look of the device and available ports have slightly changed since the first prototype was revealed last year. The system runs “Windows 8.1 with Bing NTE”, the official Microsoft operating system for mini PCs according to MeLE. I’ve received the device by Fedex in the following package. The number of accessories is quite minimal compared to ARM based Android mini PCs with just a 12V/1A power adapter, and a Quick Start Guide. The device’s enclosure is made of two parts with the top made of plastic, and the bottom and rear panel made of metal. The front panel has an LED, abnd button (with no purpose), one side comes with a USB 2.0 host port, an SD card slot, and the power button, and the reat panel features most of the ports: kensington slot, power jack, VGA output, HDMI output, Ethernet port, two more USB 2.0 host port, the Wi-Fi antenna, and the earphone jack. You can check out the unboxing video if you prefer. My favorite part of the unboxing post is to open the box to see what’s inside, and MeLE PCG03 is made to be opened so everything is pretty straightforward and comes out easily. First remove four screws on the bottom of the enclosure, and two screws on the rear panel to lift up the plastic top. The solution is comprised of a baseboard and a system-on-module. The Wi-Fi module is based on Realtek RTL8723BS. 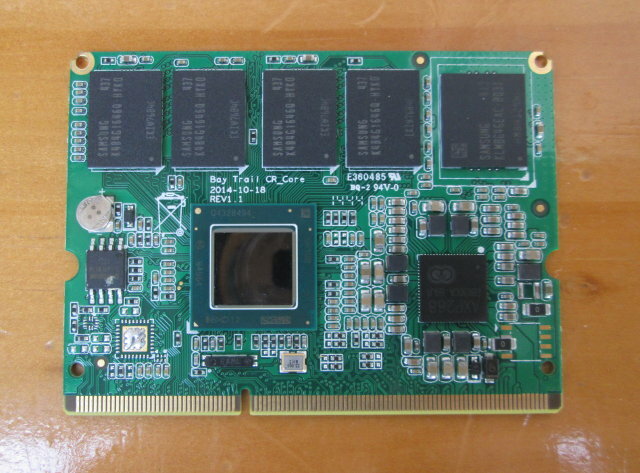 Other chips on the baseboard include ASIX AX88772CLF USB 2.0 to Fast Ethernet controller, Realtek ALC5640 multi-channel audio hub, and Analogix ANX9833 DisplayPort to VGA adapter. Intel Atom Z3735F being mostly a tablet SoC, they had to use a few extra chips to add missing features like Ethernet and VGA output, btu I guess it’s a bit still cheaper than using more powerful Bay Trail-D processor like Celeron J1800. Three headers are unpopulated on the right of the board, but I’m not sure what they are for. I’ve removed four more screws to completely take out the board. There’s an opening on the baseboard to let the Intel processor touch the thermal pad placed on top of the metallic case. Finally, I’ve taken out the CPU module by removing two tiny screws, and pushing on the metallic bits on the side of the connector. I assume this is a proprietary solution so if somehow you could upgrade the module it would have to be purchased from MeLE, but with USB 2.0 and Fast Ethernet, I’m not sure an upgrade would be that interesting any way. Intel Atom Z3735F is the shiny chip in the center of the board, and is coupled with four Samsung K4B4G1646q-HYKO DDR3L chips, and a Samsung KLMBG4GEAC-B031, a Class 2000 eMMC 5.0 flash with 32GB capacity and read and write speed rated respectively at 240 and 60 MB/s. X-Powers AXP288 is the power management IC. So does the module plug into the bottom? If so, what’s the big socket on the top that looks like an SO-DIMM slot for? Ah OK. The pictures may not make it clear. 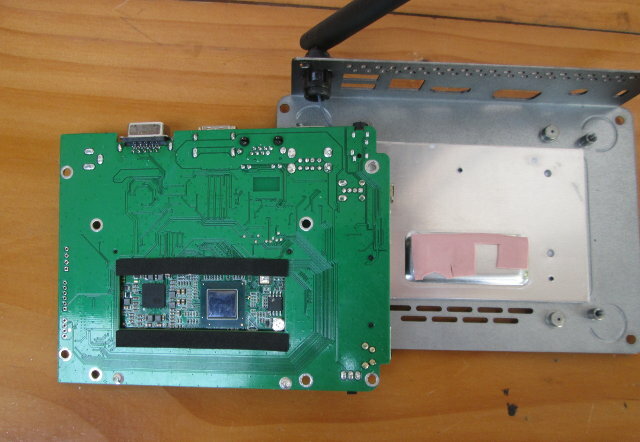 The big socket is for the module which looks all green without component on the top picture, and the CPU module is connected at the top. On the bottom picture there’s a hole in the main board which give access to the other side of the module, so that the extruded part of the casing can touch the module via the pink thermal pad. so no SATA and Ethernet only via USB? I’d like to see some Celeron N2830 or J1800/J1900 mini PCs made by Chinese. They would have Gigabit Ethernet, USB 3.0 and SATA that people ask, and probably still below $200 (without Windows license). What is Windows 8.1 with Bine NTE? Also read comments there, as people added more.